Home » Climatic vs. Climactic – What’s the Difference? When you watch a movie, you will notice that the most exciting scene usually happens near the end. In this scene, the major conflict of the plot will probably be resolved, or perhaps left unresolved in such a way that accommodates several profitable sequels in the future. One way to describe this exciting, important scene is with the word climactic. Climactic is sometimes confused with a similar word, climatic, which is spelled almost identically. Nonetheless, these words have different meanings and apply to entirely different contexts. There is no situation where climactic and climatic mean the same thing. As a writer, it is important to know the difference between these words. You would not want to accidentally refer to a weather pattern instead of the climax of a movie, after all. Continue reading to learn how to differentiate between these words. 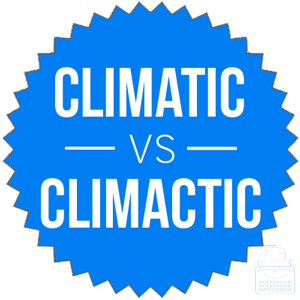 In this post, I will compare climactic vs. climatic. I will use each of these words in at least one example sentence, so you can see how they appear in context. Plus, I will show you a memory tool that makes choosing climactic or climatic a little easier. What does climactic mean? Climactic is an adjective. It means of or pertaining to the climax. The climax is the point of highest action or excitement in a story or other event. Thus, climactic is used to describe the most exciting part of something. If it turns out to be a bit of a letdown, we might use its antonym anticlimactic instead. The climactic scene in John’s favorite movie included a gunman riding a dragon into a wormhole. The climactic event in the playoff race was, unfortunately, an injury to the team’s star player. Adjectives modify nouns by describing certain qualities about them. Something that is climactic could also be said to be exciting, important, or consequential, though none of these words is a direct synonym for anticlimactic. An outdated version of climactic is climacteric. Until the mid-20th century, this was the preferred spelling, but in the past 60 years or so, it has been completely supplanted by climactic in the sense of a pertaining to the climax. The above chart graphs climatic vs. climactic in English books since 1800. What does climatic mean? Climatic is also an adjective, but its subject matter it vastly different from climactic. Climatic means of or related to the climate. The climate, at least in this context, refers to large, atmospheric patterns that influence the weather. Crops may be ready to harvest earlier or later in the season, depending on climatic influences. The earth has undergone a drastic climatic shift since the beginning of the industrial age. Climactic and climatic are both adjectives, but they have different meanings. Climactic refers to the climax of something. Since climactic has an extra C, and that is the first letter of the movie Casablanca, which has a climactic scene in an airplane hangar, you should always be able to remember that climactic refers to the climax of a story. Is it climatic or climactic? Climactic and climatic are adjectives. Climactic means of or relating to the climax of a story or event. Climatic means of or relating to the weather. The two words are not interchangeable, despite their similar spellings. 1 What is the Difference Between Climatic and Climactic? Tuff or Tough – What’s the Difference?